A moment of brilliance from the Brazilian foiled Seattle's attempts of leaving Orlando with a win. Orlando Pride: Harris; Kreiger, Mônica, Zadorsky, Pressley (Hill, min. 82); Kennedy, Nairn (Weatherholt. min. 74); Leroux, Marta, Ubogagu (van Egmond, min, 46); Morgan. Seattle Reign FC: Betos; Westphal (Nielsen, min. 77), Oyster, McNabb, Catley; Fishlock (Andrews, min. 56), Long, Utsugi; Kawasumi, Taylor, Yanez (Spencer, min. 73). SCORE: 0-1, min. 33, Long. 1-1, min. 62, Marta. REFEREE: Javier Santos Escobar (USA). Yellow Card: Betos (min. 89). Seattle Reign FC will take the point away from home but they will know they were not too far away from taking all three points had it not been for a special goal from Marta. 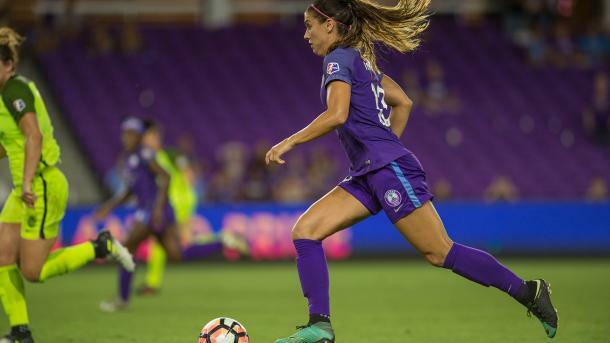 The Orlando Pride keep their home record in tact but will look to play better in the weeks to come than they did tonight in the National Women's Soccer League. The Reign had the first and last chances of the half and they were also the first ones to open the scoring tonight, albeit against the run of play. Nahomi Kawasumi found some space down the right hand side and played in a great cross into Jodi Taylor in the fifth minute but the striker was unable to keep her effort on target. After that early scare. it was all Orlando as the home team pressured high up the field to try and find a way to goal. A quick long ball towards Alex Morgan in the 11th minute created Orlando's first chance of the game as Morgan held up the ball well. She then found Alanna Kennedy who was making a late run from midfield but unfortunately for the Pride, Kennedy's effort was from a tight angle and Michelle Betos was on hand to make a save and keep the ball out of her goal. Another long ball allowed Morgan the chance to break in the 14th minute but Kristen McNabb matched Morgan step-for-step before making a fantastic tackle inside her own area to prevent Morgan from getting her shot off. Orlando's press was causing Seattle problems throughout the first half and the home side really should have done better when Allie Long gifted them the ball in Seattle's last third but Orlando could not get a shot on target. Seattle began to grow back into the game and use Orlando's press against them. There was space to be found for Seattle if they moved the ball quickly and beat the initial press and after 20 minutes or so, the away side had figured Orlando's tactics out. Rumi Utsugi, who along with Kawasumi, had just returned from international duty, played a great ball over the top that found Taylor in space but the England international took too long to settle the ball and Mônica was able to recover and make the block. Taylor, who could have scored a few goals in that first half, was again given the opportunity to put Seattle ahead after Kawasumi's cross fell to her feet but she was too casual with her finish and ended up hitting the post. The Reign's resurgence into the game paid off in the 33rd minute when Long put them ahead. Jess Fishlock had won a free kick for Seattle which Utsugi sent it and Orlando initially cleared. Megan Oyster was first to the second ball and put the ball back into the area where Long was waiting unmarked. The midfielder then coolly slotted the ball into the far corner, putting Seattle up by a goal. Fishlock had the last opportunity of the half when Seattle passed their way through Orlando's midfield and Long played Fishlock through on goal but the Welsh midfielder slipped as she took her shot and ended up hooking her shot over the crossbar. Seattle continued where they left off but all of their momentum was lost when Fishlock had to substituted out of the game due to an injury. The combinations that the Reign midfield had found to unlock Orlando where now missing a key piece and it took some time for the visitors to regain their balance. Taylor had the first real chance of the game in the 59th minute when she found some space at the top of the Orlando penalty area but her speculative effort wasn't strong enough to evade Ashlyn Harris' dive and the Pride goalkeeper gathered the shot easily. Taylor's chance was one of the few that either team could muster in the second half but Marta produced the best finish of the day in the 62nd minute. Oyster had brought down Morgan in a dangerous area and the Brazilian swung her free kick brilliantly into the top corner, giving Betos no chance to save it. Beverly Yanez and Rumi Utsugi both had shots on target not too long after Marta's goal but neither could find the game-winner for Seattle and so it ended all square at the Orlando City Stadium.